Imagine manifesting your visionary idea into a brand that creates a ripple effect of change throughout the world. Except that it’s not always clear how to navigate through the process of branding, especially if you’re on a budget and have limited resources. Your brand’s purpose is unique to you, which is why it is one of the best ways you could differentiate your brand. As an impact entrepreneur, it’s important to reflect and share your brand’s story about: why do you do what you do? Articulate a clear vision to guide your business decisions. Your vision is a long-term view of your strategic path and the impact you intend to make. Having it clear and concise, will save you costly mistakes such as re-naming and re-branding later on, which once you’ve already established your brand in the market can be a big hassle. Having a well-grounded vision provides clarity for you and anyone else in your company, and acts as a metric so that you know when you’ve made the impact that you originally set out to make. A transparent vision will also help align important company decisions with achieving your goal. When brainstorming a vision statement, avoid statements such as “we will achieve X revenues” that are too self-serving. Instead, create a vision statement that will also appeal to your customers, and connect with them on an emotional level. Brand truths are a set of underlying behavioural values specific to each of us. They help govern our behaviour, inspire us, and guide our moral compass, especially in situations where what is “right” isn’t always clear. As a social entrepreneur, your business is practically an extension of you, and should therefore embody your own values. Within a business context, your own brand values affect the your brand’s corporate culture, the talent you attract, and also drives your business strategy. A positioning statement is generally used internally or in pitches to describe your business. Clarity and specificity is key when positioning your brand: Rather than having the best quality or service, narrow down on the details of what really sets your product or service apart. Another approach to this question is to think… what do you want to be famous for? You should also be thinking about who your ideal customer is. Again, get really specific with this… It might feel like you’re pigeonholing your business with such a narrow target, because brand positioning is counterintuitive. Less is more, and by focusing on a specific target, you’ll be able to direct your energy and resources most effectively and build your brand’s reputation. That’s not to say you can’t broaden your target in the future, when you’ve better established your business. Having said that, in the early days it’s vital to narrow your focus. A brand becomes famous in the industry by being the first, the best, or the only. So if beauty is in the eye of the beholder as they say, your brand needs to exude appeal and stand out to your customers. Although you may know why and how your business is unique, your customers may not know why and so it’s important to differentiate your social enterprise’s business model. Let customers know why you’re unique effectively by using language that they are are familiar with and that will resonate with them. As an social entrepreneur starting up a brand, you’re likely an expert in your field. It’s easy to overlook the fact that the words and industry jargon you’re familiar with may not be familiar with your customers. For this reason, put yourself in the shoes of the customer and hypothetically think what kind of language you would use if you didn’t know what you know today. Relationships are built based on connections, which is why your brand needs to use language that customers will click with and understand. In other words, the more empathic you are and can get into your customer’s head and then mirror that inner conversation for your customer the more likely your messaging will turn leads into sales. Call it a tagline or a slogan, your brand promise is simply a truthful statement of what your business is committed to providing your customers. It’s your opportunity to briefly describe in a nutshell what your business is promising while also creating an emotional connection and/or pulling on the heartstrings of your customers. It should be memorable, concise and have personality. Take your customers on a journey. Create an experience that will knock their socks off… beginning even before any purchase is made, when the purchase occurs, and finally, after the sale has been made. By brainstorming creative ways to improve the customer experience, you’re leveraging your potential leads and creating a happy and satisfied customer base. This will help you to attract more customers, stand out from your competitors, and amplify the buzz surrounding your business! Recognize this? 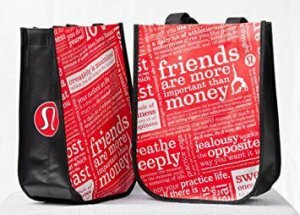 It’s the instantly recognizable red, black, and white reusable bag that Lululemon puts your purchase in when you’ve bought something from the store. Lululemon incorporated their brand manifesto into the design of their product bag. It’s a brilliant way to help publicize their company values and spread their lifestyle movement. So what exactly are you offering? Describing your product offer may be simple, but there are better ways to approach it than others. You may have a fantastic product, but it might not get the great response you know it deserves because your product positioning isn’t as effective as it could be. Positioning your product around a result that’s highly desired by your customers is an extremely powerful way for you to name your product. I’ve gone into more detail about naming your brand and provided more tips to creating a lovable business name in my article here. It is important to keep in mind, however, that your name isn’t the only way to communicate your brand to customers. It’s what you do with your name that will make it great. Inspire your customers and get them engaged by starting a movement . Provide the means for people to connect with your brand and belong in a community of likeminded individuals through simple steps like creating a Facebook group will provide a platform for members of your community can meet and connect. Establish a relationship with your customers by providing a cause for them to rally behind while inspiring change and impact. Jamie Oliver, for example, is well-known for his culinary skills, but also for leading the Jamie Oliver Food Revolution. It’s a movement focused on empowering individuals with cooking skills and educating youth on healthy eating through different organized food education programmes. The members of this movement are a community, working towards a healthier world. In the comments, I’d love to hear – What brand movements are you a part of? Wow this article is incredibly helpful!!!! Thank you so much, it couldn’t be more perfect timing considering I’m about to launch a new brand. I would have missed so many of these points! Super valuable!!! Thank you! Thanks for your comments and can’t wait to see how you apply this in your branding! Focusing with laser like vision on what’s most important has been key to growing my brand One More Woman! 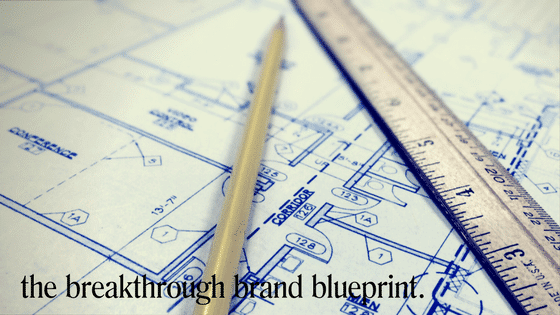 Thanks for these essential elements of branding. I’ve loved working with your team!! Well given your vision to support female entrepreneurs, it’s our HONOUR!